This week, the University of Texas began to wonder whether to remove the name of William S. Simkins from one of its dormitories. Simkins was a confederate soldier, a professor in UT’s School of Law (from 1899-1929, and most problematic for UT today, a member of the Klu Klux Klan. 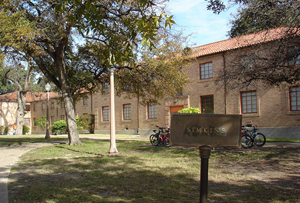 The building was named for Simkins in 1955 in recognition of his work for the University — and perhaps symbolically to identify Texas’s desire not to integrate. I am quite sympathetic to Professor Russell’s feeling that Simkins name is inappropriate on a building dedicated to equality and enlightened education. I am afraid, though, that through efforts like these, we will look back on our history and wonder why we felt the need to purge it so. History is made up of the good and the bad, of good people making bad decisions, of bad people making thoughtfully astute and beneficial decisions, and everyone else caught in the milieu of time and happenstance. On the one hand, we cannot and must not belittle the real offense that African Americans must suffer by the presence of a name connected with a vile racist past. But on the other hand, does removing the name really bring us comfort that the University has disassociated itself with its racist past. For as long as there have been people that have crossed the University of Texas campus since 1955, the building will forever be called Simkins Hall; I imagine that for some generations that will continue. Indeed, short of imploding the building from the grounds and eradicating its memory from the space it occupies, Simkins will forever be known as a part of the UT campus, both the prejudicial Simkins and the University contributor. Yes. Destruction feels cleaner. But if it feels cleaner its because we have grown uncomfortable with the dirt we can see. There is more dirt around — we have not yet had time to notice (or maybe never will notice) its impact, or to yet be uncomfortable with its role in our own development. So instead of renaming the building or taking Simkin’s name down, do something enlightened. Build a prominent display in the building that speaks openly and honestly about the struggles the UT campus has had with race; maybe add a name to the building of a person that fought for civil rights in the State of Texas to pair along side Simkins – perhaps Marshall and Simkins Hall. Take the opportunity to recognize our vile past, and talk openly about it. Our future generations will be better for it. In each of these things, the University will be responsible with its past, which includes honoring for a time a person whom the University is not proud of in every respect and recognizing that the University can mature beyond the narrow ideas of a few. Update: There is a nice write up on the controversy at the faculty lounge here, along with a set of links to the controversy. Tom Russell in comments provides more information on the controversy as well as a call for responses to the Texas Board of Regents planning to meet on the issue soon. Update 2: Al Brophy at the Faculty Lounge talks about the role of historical memory in decisions to take down emblems from our racist past here. In the comments, Tom Russell provides some thoughtful responses, to which i will respond soon. This is a great discussion! I confess that my spontaneous reaction was to cheer on removal of the name as I hadn’t really thought too much about this, but your reasons for not doing so strike me now as rather persuasive. Regrettably, when I was a student I gave little or no thought to the names of our various buildings, assuming they were associated with some former innocuous administrator or philanthropist…. Thanks Patrick. I was worried that my tone was going to come off as unsympathetic towards the movement to take the name down.